The following two maps show considerable detail of the area where Tom Applewhite was shot down and the first part of his escape route. Their coverage overlaps. 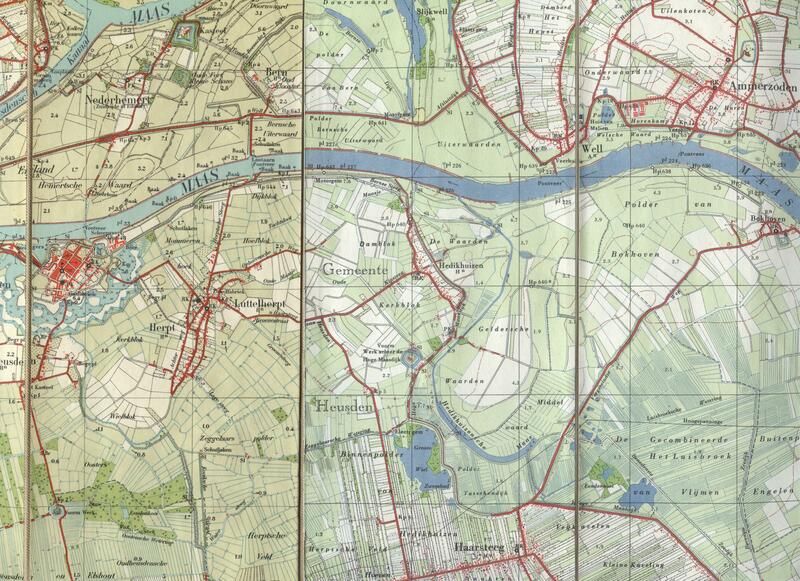 My thanks to Thomas Versteegh of the website “Old Topographic Maps Collection (Oude Stafkaarten Verzamelen)” at http://www.oudestafkaarten.nl/ for making them available. This map shows the area where the crew of “The Wild Hare” parachute to earth on 11 November 1943. With the exception of Jimmy French, who is killed,, probably while hanging in his parachute, and Tom Applewhite and Nello Malavasi, who escape, the rest of the crew are arrested and temporarily locked up in a makeshift jail in Heusden, show below on the left. (Malavasi is arrested with his guide four days later in Turnhout.) (For a list of the crew, click here.) Tom Applewhite lands in the fields immediately to the west of the village of Hedikhuizen (in the center of the map). Jan van Bommel, a teenage boy who arrives on the scene, urges Tom to run across the dike on which Hedikhuizen perches to a barn in the field to the east of the village of Hedikhuizen. There he can hide until dark when he will be picked up, transported by rowboat to the north side of the river Maas, and hidden in the farmhouse of Peek and Nellie de Noo on the northern outskirts of the village of Well. Tom hides with the de Noo family for two days while German soldiers do a house-to-house search for him. They know the size of a B-17 crew and know that two men–Tom and Nello Malavasi–are still unaccounted for. On 13 November 1943, Adriaan de Noo, brother of Peek, take Tom back across the Maas on a small ferryboat and then, using bicycles, along the path on the top of the dike on the south side of the river to the village of Bokhoven for a rendezvous with two men who are to be his guides. 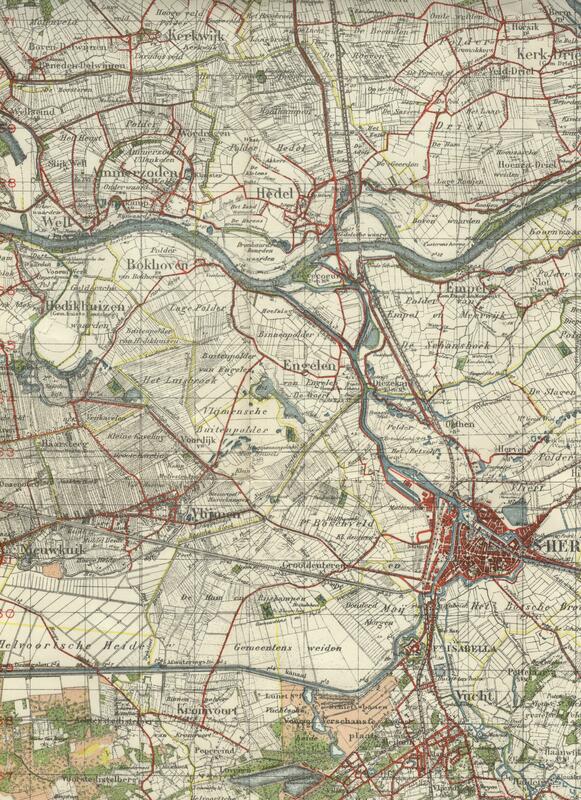 Bokhoven is on the far right of the map on the south side of the Maas. To see a particular part of the map, position the cursor over that spot. Then click on the map once to enlarge it and click again to enlarge it even further. This map overlaps the previous map, showing the area farther to the east, and has a different scale. Hedikhuizen is near the west edge of the map with Bokhoven to the east of it. The path on the top of the dike on the south side of the Maas is also visible. Tom and Adriaan meet the Raaijmakers brothers, Jacques and Fons, on the outskirts of Bokhoven who are to be his guides on the next leg of his trip, through the city of Den Bosch (‘s-Hertogenbosch) and Vught (Vucht). Probably somewhere south of Vught they pass him on to a new set of guides, names unknown, who take him to a tavern near Moergestel. At the tavern, Jan Naaijkens takes over. For a list of Tom’s helpers and how they all fit in to the story of his escape, click here. To see photos of many of his helpers and some of the places where he stayed, click here.